How Can I Keep My Aluminum Fence Clean? How are you keeping your fence clean? The good news is that your aluminum fencing is a low-maintenance, easy-to-clean material. 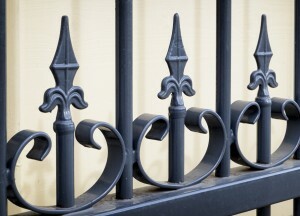 Over time, the accumulation of dirt, pollen, and grime can dull the look of your Power’s Fence. The finish itself is unaffected, but the layer of dirt that covers your fence coating should be removed. Cleaning dirt and debris from your fence require a quick hose-down. If your fence has been coated in a little mud or debris, you should find that some water is all you need to get your railings looking like new again. If you don’t have a hose on the property, simply fill a bucket with water to wipe or wash the dirt away. If you’ve waited several years to clean your aluminum fence for the first time, it may need a more thorough cleaning. Using water, a mild and non-abrasive soap, and a sponge, simply scrub off the dirt. Don’t use a dry or very rough sponge, which can damage the surface of the railing and cause scratches. Afterward, rinse with water. While the aluminum fence itself requires little to no upkeep, you should always keep an eye on the fasteners and hinges. Check to see if they’re dirty, need tightening, or even rusting. Our materials are constructed with heavy wall aluminum extrusions and finished with Platinum Certified DuPont Armor-Guard™ TGIC polyester powder coating. To top it off, our aluminum fencing comes with a limited lifetime guarantee. If you don’t like the look of the powder coating as time goes by, you can easily scrub it off with water. Be sure to polish the railing so that it continues to shine!